Our research aims to characterize the physiological and pathological actions of chemokines in the central nervous system (CNS) in order to foster the development of new therapeutic approaches against neuroinflammatory and neurodegenerative disorders, including neuroAIDS. 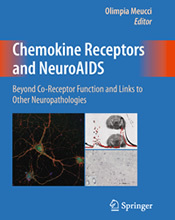 These chemokines and their receptors are widely expressed in the CNS and involved in essential physiological processes during developments as well as adult life, such as proliferation and differentiation of neural precursors, neuronal migration, neurotransmission, immune surveillance and cell-to-cell communication. 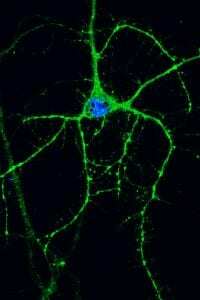 Thus alteration of their function may contribute to different pathologies. In addition, as chemokine receptors (CCR5 and CXCR4) are co-receptors for the HIV-1 envelope protein gp120, they are also directly involved in HIV infection and neuropathology. Ongoing studies focus on the effects of selected chemokines, namely CXCL12 and CX3CL1, and their receptors (CXCR4/CXCR7 and CX3CR1) on neurons and glia with particular interest in the molecular mechanisms involved in excitotoxicity, synaptic/dendritic damage, and repair processes. Due to interdependence of drug abuse with HIV infection, a major area of investigation in our lab concerns the interaction between chemokine receptors and opiate receptors. These studies have highlighted novel actions of opiate agonists on neurons, involving the protein ferritin heavy chain, which may explain some of the detrimental effects of opiate abuse in the brain. Finally, our previous discoveries related to the action of the chemokine CXCL12 on cell cycle proteins and survival have also prompted new studies in the field of cancer biology, which are conducted in collaboration with other groups. Current studies aim to determine the effect of chemokines on the survival, migration and differentiation of cancer cells at metastatic sites. In collaboration with Dr. Fatatis, we have been studying the involvement of CX3CL1 in the development of prostate cancer metastases to the bone. Other emerging collaborations focus on the role of CXCR4/CXCR7 in brain neoplasia.